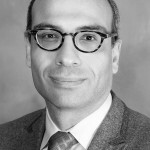 Mehdi Khalaji is an Iranian-American writer, scholar of Islamic studies and political analyst. Khalaji is the Libitzky Family fellow at The Washington Institute, focusing on the politics of Iran and Shiite groups in the Middle East. A Shiite theologian by training, Khalaji has also served on the editorial boards of two prominent Iranian periodicals and produced for the BBC as well as the U.S. government’s Persian news service. From 1986 to 2000, Khalaji trained in the seminaries of Qom, the traditional center of Iran’s clerical establishment. There he studied theology and jurisprudence, earning a doctorate and researching widely on modern intellectual and philosophical-political developments in Iran and the wider Islamic and Western worlds. In Qom, and later in Tehran, Khalaji launched a career in journalism, first serving on the editorial board of a theological journal, Naqd va Nazar, and then the daily Entekhab. In addition to his own writing, he has translated the works of the humanist Islamic scholar Muhammad Arkoun. In 2000, Khalaji moved to Paris where he studied Shiite theology and exegesis in the Ecole Pratique des Hautes Etudes. He also worked for BBC Persian as a political analyst on Iranian affairs, eventually becoming a broadcaster for the Prague-based Radio Farda, the Persian-language service of the U.S. government’s Radio Free Europe/Radio Liberty. At Radio Farda, he produced news, features, and analysis on a range of Middle Eastern, Iranian, and Islamic issues. Thank You for Investing in Peace building and friendship dialogue. Your donation -of any amount- will help us to bring a brighter future for the region.